You are here: Home / Testimonials / Everything happened as it should and I am proud of my birth! After reading another Hypnobirthing mummas amazing story I was inspired to write my own birth story. She expressed how proud she felt even though it was not the birth she had pictured. This really resonated with me. At 40+6 days I had another stretch and sweep which got the ball rolling woohoo By 6 pm that night I started getting back pain and some mild cramping. I didn’t want to get too excited, plus my husband had a gig to play that night and if I had of told him he would have been freaking out during the show so I kept things under wraps and decided to see how things panned out. Just to be safe though I called my Dad to come and pick up our other little man for a sleepover. I knew my instincts were right though so I decided to take some panadol and get some sleep. 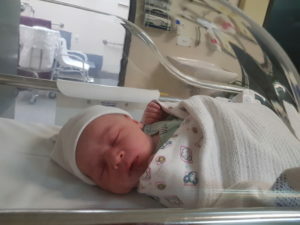 Hubby got home around 10ish and was none the wiser 🙂 I woke around 3 am to stronger surges and knew today was the day we were going to meet our baby. I continued to rest for a couple of hours, listening to rainbow mist and the affirmations track. By 5 am the surges were only a couple of mins apart so I woke hubby with a big smile to let him know it was D day. I decided to have a shower then call my midwife to let her know what was happening. We left home around 6 am, I was at the point that if I had of left it any longer it would have been uncomfortable to travel. My beautiful midwife met us at the hospital and after some monitoring of bubs heart rate (it had been slightly elevated the past week) she did a VE and was pleased to tell me I was 6cm, so off to birth suite we go. I was really excited to know things were progressing quickly since my last birth was a long one. We set the room up, dimmed the lights and I settled into the armchair with my Hypno tracks again. I was lucky that I had the same midwife for my first birth so she knew all my preferences and let me do my thing. Hours passed and I was hypnobirthing like a boss, breathing through the surges which were intensifying. Hubby rubbed my back and applied heat when I gave him ‘the look’ or hand squeeze. After around 4 hours my midwife offered another VE which was standard procedure and I took her up on the offer, I was excited to know if I was close to meeting our baby. In hindsight, wish I hadn’t because when she told me I hadn’t dilated any during this time I felt deflated and unsure if I could do it. My cervix was still behind the baby’s head as well which was probably prolonging things as well. Kylie offered to break my waters which I needed during my first birth as well. I was prepared for things to intensify after that but I felt like I lost my focus. The next hour and a half was a wild ride. I went from 6 to 10cm loud and proud, I’m sure the whole hospital could hear me vocalise each surge. It was so much more intense than my first birth that was very calm in comparison so I was surprised at how I birthed my second baby. I changed positions a number of times from all fours to squatting with a lot of rocking in between, it’s amazing how your body knows what to do. 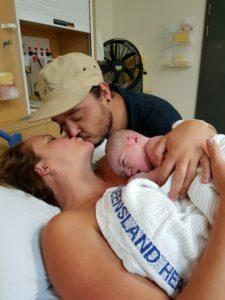 I knew when it was time to breathe my baby down and with the guidance of my amazing midwife and supportive husband that encouraged me the whole time our beautiful baby boy was born. He had a good set of lungs and weighed a healthy 3.9 kg (big bubba compared to my first who was the only 2.4kg) safe to say he put me through the paces. I spent the next few days feeling a bit disappointed in how I handled things in the end so I contacted Melissa to recap. Once again she was amazing and told me to rock my crown and gave me some other great advice which left me feeling empowered. I realised that everything happened how it should have. Even though it wasn’t as calm as my first birth I safely delivered my bub with little intervention and that’s something I can be proud of.